This platform equipment set is suitable for Era II on. In addition to railway staff and travellers with their cases and trunks the set contains appropriate advertising posters and information boards luggage carts a wheelbarrow with wooden chest trolleys with brooms and shovels for cleaning the platforms and benches. 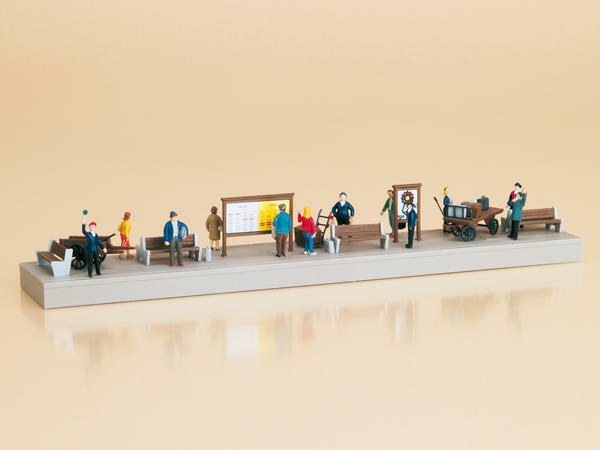 Unpainted railway staff and passengers (six of each) are included. You decide the period in which your model scene occurs by your choice of the passengers’ clothing.